If you have missing teeth, it creates problems with biting and chewing, and if it's near the front, you're likely to be self-conscious as well. There are hidden problems too. When you lose a tooth, your jawbone and surrounding tissues start to "resorb" or shrink. This is why the faces of edentulous people - that's people with missing teeth, including those with full dentures - often have that sunken look. 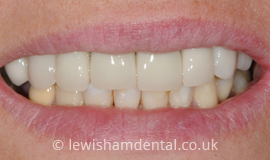 Thanks to modern dentistry, we at Lewisham Dental Practice can solve these problems with dental implants, which are metal screws placed permanently in the jaw, on top of which we attach a false tooth. 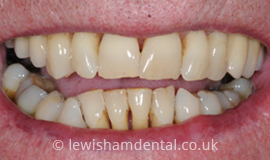 We are very fortunate at Lewisham Dental Practice to have the implantology expertise of Prosthodontic Specialist Dr Wassim Chawick. Dr Chawick uses implants made by Biomet 3i, an innovative company widely respected for its range of minimally invasive Dental Implants. Assessment - We assess the state of your jawbone and gum where the tooth was lost. Depending on the state of the jaw we sometimes need to prepare the site by doing a bone graft or sinus lift, which will build up the jawbone where the implant will go. As soon as you are ready, we make an appointment to place the implant. 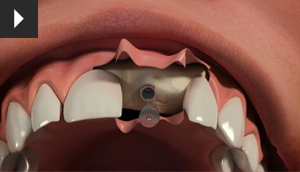 Implant placement - The metal implant is screwed into the jawbone and left for about three to six months. During this time new bone grows around the implant, securing it in a process called osseointegration. Abutment and crown placement - A connecting piece called an abutment is screwed into the implant and a false tooth made to exactly fit and match your other teeth is placed on top. 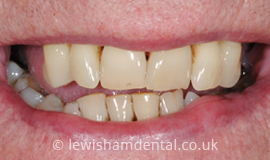 The quality of these restorations is such that you can easily forget which tooth is the false one! Caring for your implant - Our hygienist will show you how best to care for your implant. There's nothing complicated but it is important that you maintain a healthy mouth because, as with any other tooth, you don't want to create problems that may threaten the implant's stability. Often there is more than one missing tooth. In fact ,replacing all of the teeth with implants - called a full-arch rehabilitation - is quite common and an alternative to dentures. Dr Chawick has done many full-arch rehabilitations, so he will be happy to advise you. 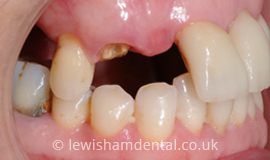 If you want to do something about missing teeth or loose dentures, please contact us. You can call us at 020 8852 3000 or email us through this website and we will get back to you. Alternatively you will find us right in the Lewisham Town Centre on the Lee High Road, close to Blackheath, Greenwich and Catford. 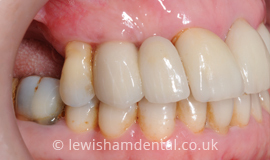 Procera All Ceram combines excellent and profound strength with beautiful aesthetics. The material consists of 99.5 percent pure aluminum oxide and is biocompatible, thereby ensuring excellent long-term beauty. 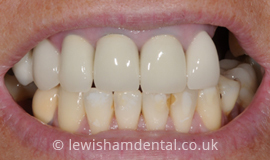 Procera All Ceram is translucent giving the tooth a natural appearance. At the same time Procera All Ceram is excellent for concealing underlying surfaces, such as amalgam and root fillings. This ceramic is also customized but still industrially produced, ensuring predictable results.